I co-authored this book with electroacoustic composer, Professor Monty Adkins. We collaborated between 2010 and 2011 on an audio-visual exploration into synergy between music and painting through examination of aspects of Japanese aesthetics. Two key texts, for my chapters in the book, were Richard Sennett’s examination of material culture and ‘making things well’ in his book ‘The Craftsman’ and also the poetic reflections of Junichiro Tanizaki’s in his book ‘In Praise of Shadows’. The collaboration was the result of a Leverhulme Trust Award Artist in Residence at the University of Huddersfield, Department of Music. 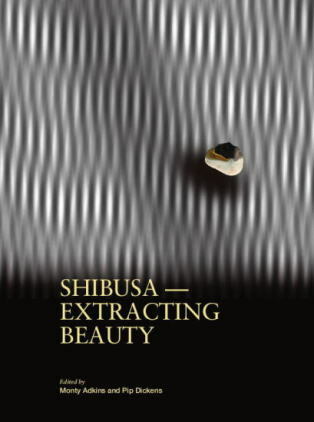 SHIBUSA - Extracting Beauty raises some timely issues relating to high technology versus hand skills both in terms of Western contemporary art practice (audio and visual) and also the dwindling kimono industry in Japan. With regard to the latter, it includes interviews with brave contemporary Japanese designers who are bridging the chasm between tradition and the dynamics of a global economy. My research took place in Kyoto in early April 2011 (just days after the devastating Tsunami) – whilst there I interviewed Kyoto craftsmen through introduction by Professor Yuzo Murayama of Doshisha University. My warmest thanks go to these craftsmen: Taro Matsumara, Yunosuke Kawabe and a special thank you to Makoto Mori for contributing an in-depth chapter on the history of the kimono garment for our book. Contents can be viewed here this link will also take you to extracts from each Chapter of the book. The book is available from most book retailers.